A young Hawaiian monk seal that was removed from the wild last year for treatment and rehabilitation is providing researchers at the University of California, Santa Cruz, with a rare opportunity to study the physiology of this critically endangered species. Ultimately, the information from these studies can be used to help monk seals in the wild, said Terrie Williams, a professor of ecology and evolutionary biology at UC Santa Cruz, who is overseeing the research in coordination with the NOAA Fisheries Service’s Marine Mammal Health and Stranding Response Program, the Marine Mammal Center in Sausalito, and other researchers. The seal – named Hoailona and also known by its field identification number, KP2 – is currently being evaluated at UCSC’s Long Marine Laboratory and may need eye surgery to treat cataracts in both eyes. Hoailona was abandoned by his mother a few days after his birth in May 2008. Rescued from a beach on Kauai, he was cared for by scientists from the NOAA Fisheries Service and released back to the wild on the island of Molokai in December 2008. But Hoailona did not adapt well to life in the wild. Habituated to humans, he began hanging out at a popular wharf and interacting with people in the water and on the beach. Hoailona soon became a celebrity on Molokai, playing with and being fed by people instead of learning how to live as a wild monk seal. As he grew larger, his interactions with people began to pose a risk to his own welfare as well as to public safety. 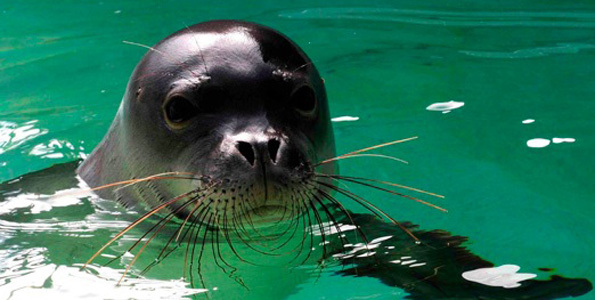 To address these concerns, NOAA officials removed Hoailona from the wild in November 2009 with the intention of relocating him to a remote area in the Hawaiian Islands where there are numerous seals for him to interact with and very few people. During a veterinary evaluation in preparation for his relocation, however, it was discovered that Hoailona had a degenerative eye condition that would seriously hamper his ability to care for himself in the wild. Therefore, NOAA officials decided that it was best for Hoailona to be kept under expert care and not released back into the wild. A team of marine mammal scientists and veterinarians from UCSC and elsewhere are currently evaluating Hoailona to assess his overall health and determine the appropriate treatment for his eyes. UCSC’s Long Marine Laboratory is one of the leading marine mammal research centers in the world and has the facilities to do surgery on a marine mammal if that proves necessary. Such facilities are not available in Hawaii. Williams is particularly interested in conducting basic metabolic studies that will help researchers understand how much energy a monk seal has to expend to find food and thrive in different environments. In the controlled environment at Long Marine Lab, researchers can measure Hoailona’s oxygen consumption and calculate how much energy he expends per swimming stroke. They can also study his responses to different water temperatures. This information, when combined with data from electronic tags that record the dives of wild monk seals, will enable researchers to evaluate the suitability of different habitats for wild seals. By counting the number of strokes an animal takes to hunt or dive, researchers can assign an energy “cost” to each of those activities. By studying Hoailona’s responses to different water temperatures, Williams hopes to learn how sensitive monk seals are to changes in ocean temperature. This is important for understanding how vulnerable the species may be to climate change, she said. 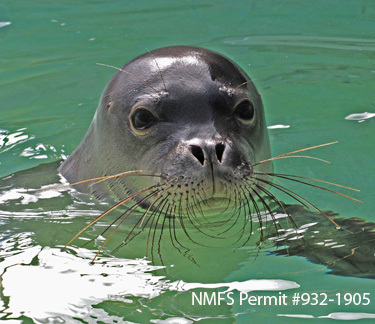 The current population of Hawaiian monk seals is only about 1,100, and their numbers have been declining at a rate of about 4 percent per year. Most of the population is in the Northwestern Hawaiian Islands, while a smaller subpopulation is found in the main Hawaiian Islands. The long-term plan for Hoailona is to return him to Hawaii to be kept at a facility where he can be seen by the public. Currently, Hoailona is not on public display at Long Marine Lab, where he is under quarantine to minimize the risk of disease or infection. Plans to return him to Hawaii would be jeopardized if he contracted an illness on the mainland. In the meantime, this rare Hawaiian monk seal is serving as an important scientific ambassador for his species, Williams said. my name is elizabeth. I’m from Moloka’i, i would like hoailona to come back to Moloka’i. we miss him here and we would like it for him to come back. I think it’s good for him.If i was a seal i would like to be free and enjoy what the world has to give me. A lot of people enjoy hoailona here. The keiki’s likes to play and swim with him.So, i hope he comes back here to stay.